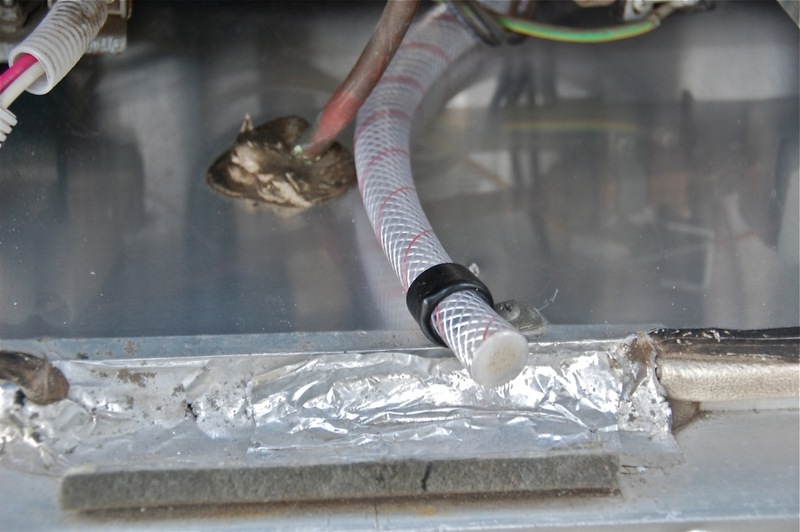 Our Airstream Safari trailer became 9 years old last December when I discovered that our Dometic refrigerator drainage tube was falling apart behind the lower, vented, outside panel door of the refrigerator compartment. The OEM white, thin plastic drainage tubing becomes brittle and falls apart, some say as early as 3-years old, undoubtedly accelerated by being near heat. 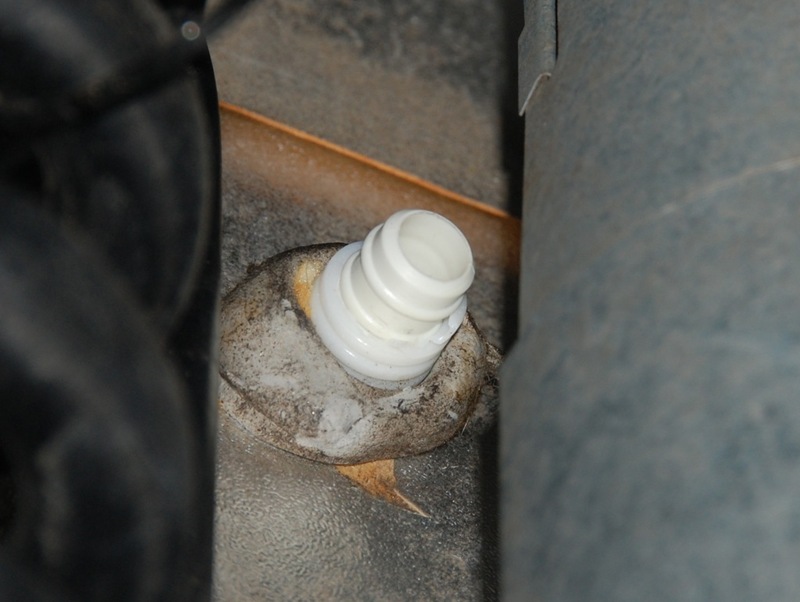 This was not an immediate problem because water only drains out of this tubing when defrosting the refrigerator or when condensation forms and drips from the cooling fins, and we live and camp in a relatively dry climate. Typically, we can go 2-3 trips before needing to defrost the refrigerator. After our third trip to the desert and coyotes this season,* it was time to replace this failed part, so I rustled up three feet of a more durable, vinyl plastic hose from our local West Marine store. Shields Rubber Series 162 Polyester Reinforced Clear PVC Tubing, 1/2″ ID (inside diameter). 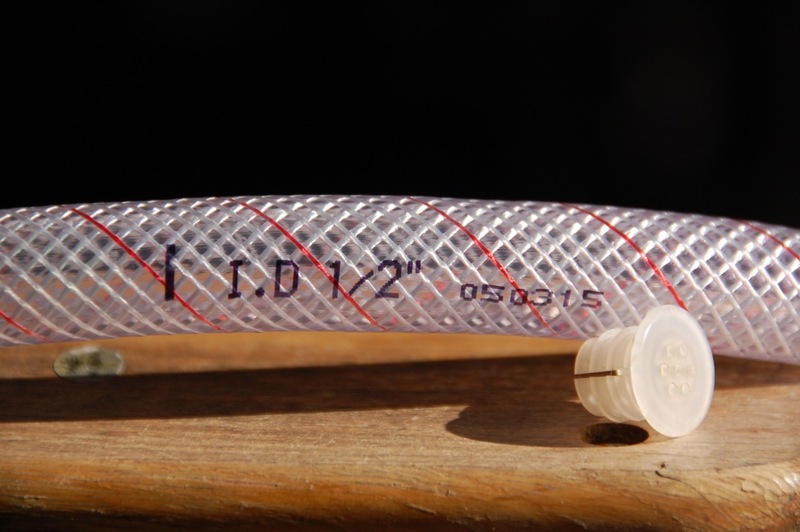 I chose this tubing over the clear vinyl tubing because it is reinforced, can tolerate hot water (or being in a hot space such as near the boiler tube), more flexible and is slightly less expensive than their clear vinyl tubing. We saved the original Dometic drainage plug (seen above), which is valuable because it keeps critters out of the tubing and currently costs $11.99 to replace! 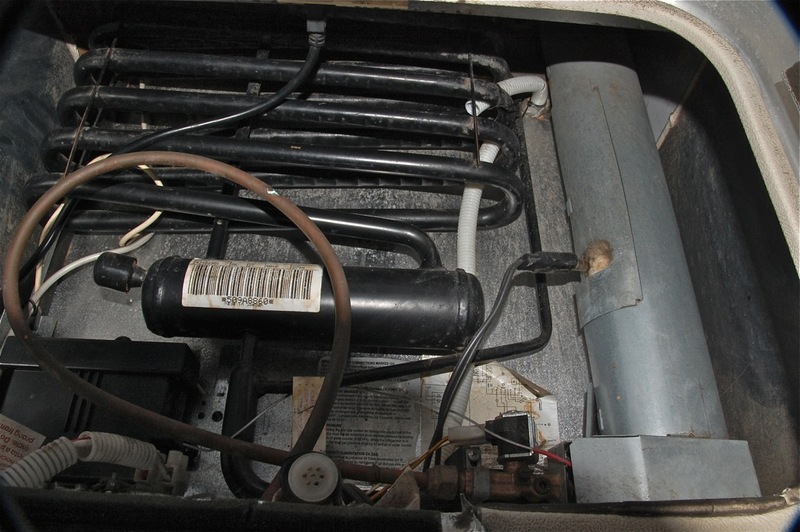 Some have found that the only way to gain access to where this OEM tubing connects to the Dometic drain pipe in the back of the refrigerator is to move, tilt or slide the refrigerator towards the trailer interior, which involves disconnecting the gas, AC and DC power, and foot screws! 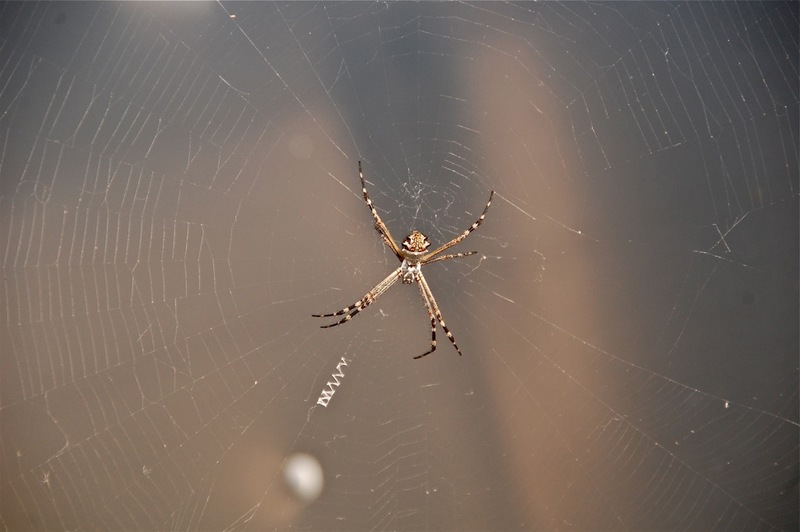 In our case, I was able to reach this spot with my hand. The old tubing was easy to remove because it disintegrated as I touched it! The new tubing was attached to the protruding end of the Dometic white drain pipe seen below. 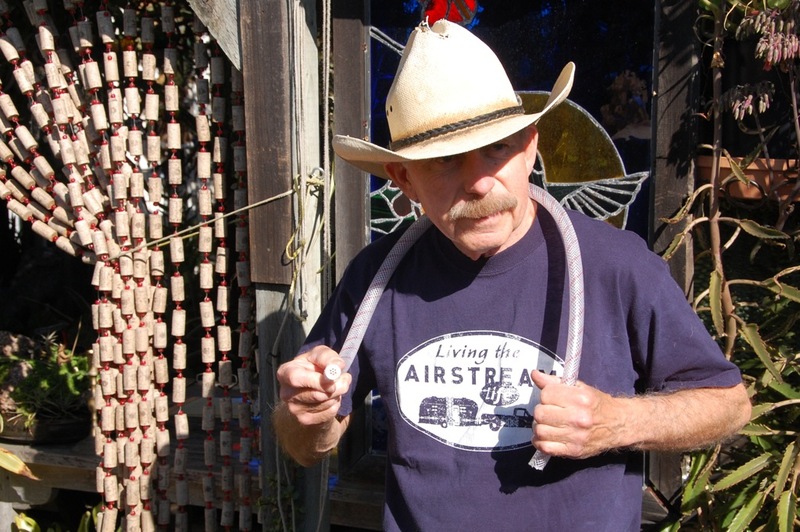 Larry held the pipe/cup from inside the trailer while I pushed the new tubing into place. 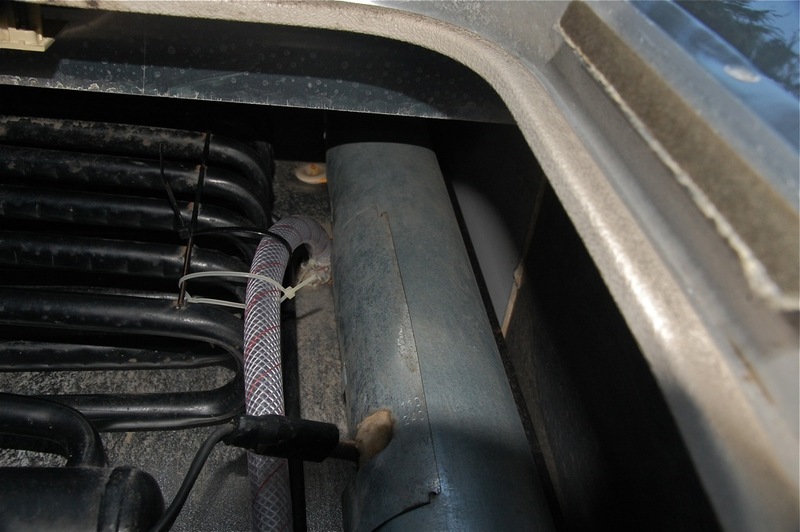 Cable (zip) ties were used to secure the tubing connection and to keep it away from the boiler tube seen below. 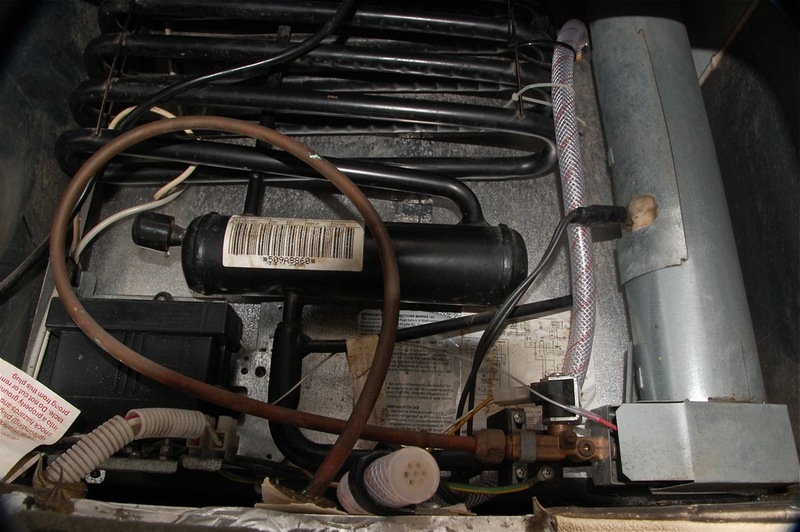 Once the tubing reached the refrigerator compartment floor, it was brought to the opening of the space and secured by the OEM black vinyl coated loop hose clamp and Phillips head screw. At this point, the tubing was trimmed and the Dometic drain plug was inserted. Refrigerator water is now properly channeled and free to flow under the lower refrigerator access panel door and exit the trailer. I am confident that this tubing will last for many years to come! 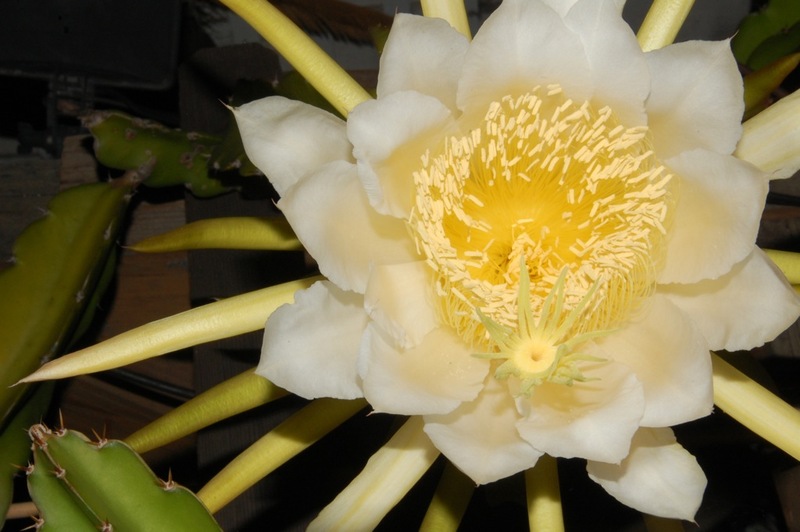 On the eve of summer solstice, our night-blooming Queen of the Night (Epiphyllum oxypetalum) produced six blooms by our outdoor kitchen (See “A night-blooming interlude“, History Safari Expresso). 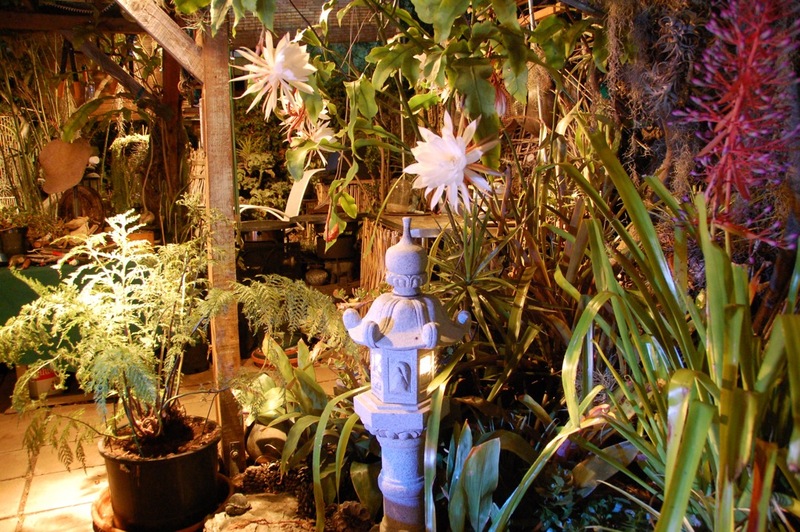 Under the Full Buck Moon,* our pitahaya (Hylocereus undatus) sent up into the heavens its first spectacular bloom over the patio pergola (See “A pitahaya summer interlude,” History Safari Expresso). 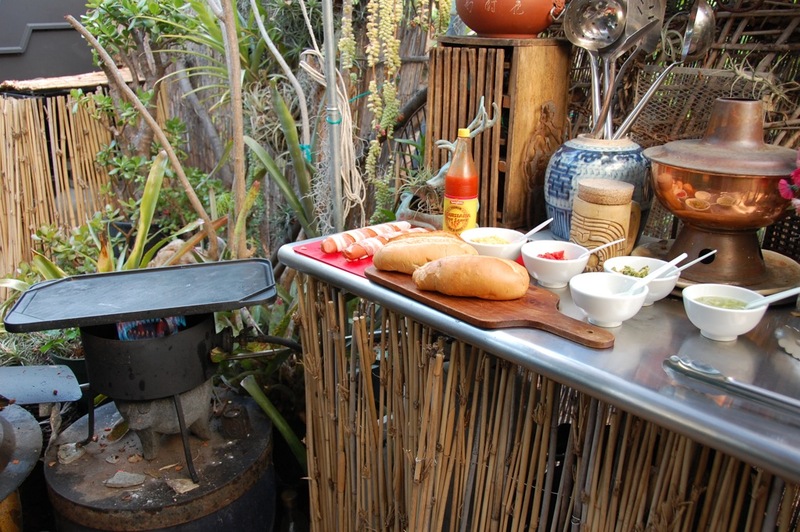 For my turn in our outdoor kitchen, I made my version of the Sonoran hot dog, based on a recipe adapted from Robb Walsh’s The Tex-Mex Grill and Backyard Barbacoa Cookbook. 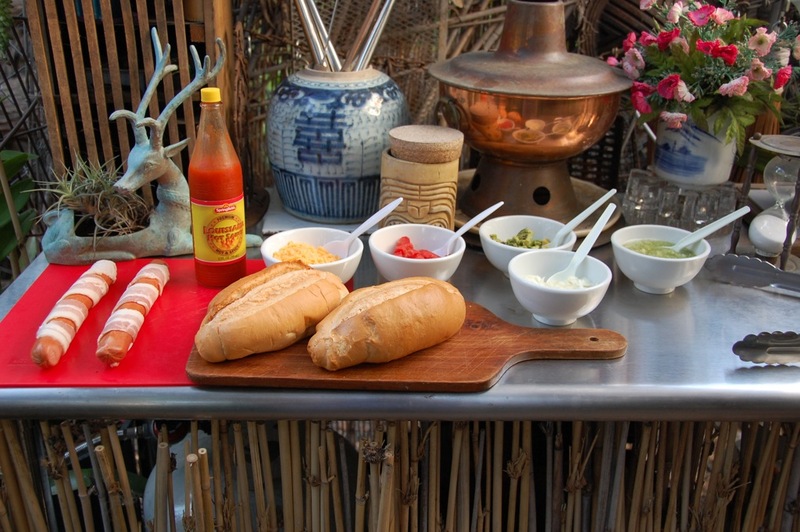 A Sonoran-style hot dog is a grilled bacon-wrapped hot dog placed in a toasted bolillo (Mexican-style bun) and topped with your favorite condiments. I prepared bowls of chopped tomato, onion, avocado, grated cheese, refried beans, and fresh salsa verde (made by Larry). 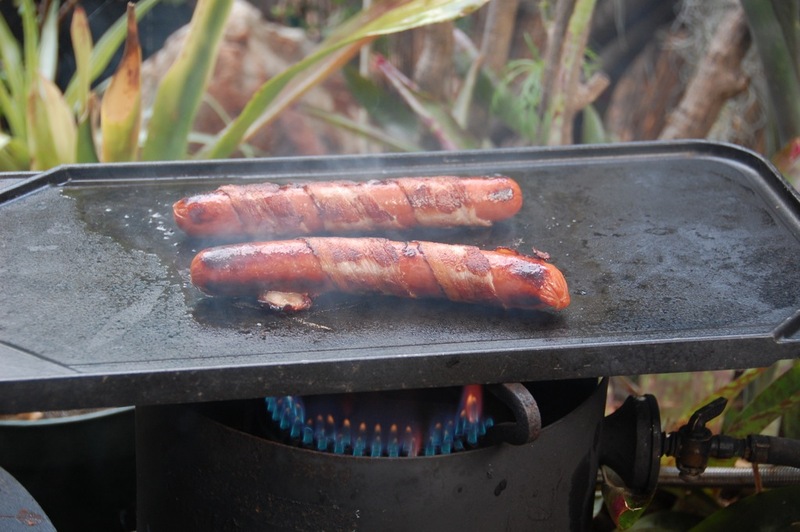 The grill was fired up and the dogs were cooked until the bacon was crispy (about 7 minutes). 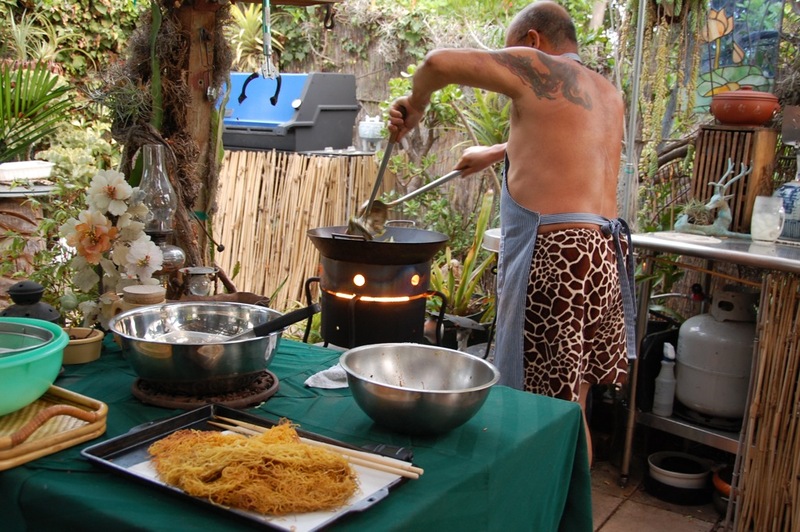 The bolillos were toasted and the pocket was lined with refried beans, avocado and cheese. 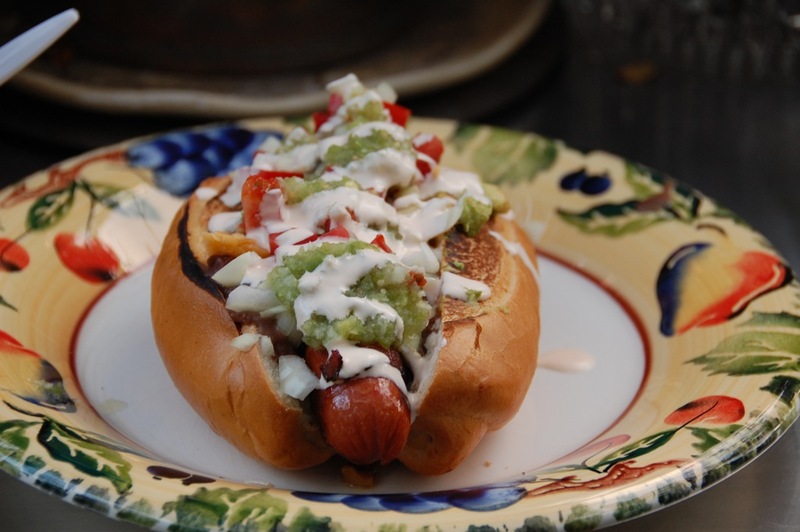 The cooked dog was placed inside and topped with chopped onions, tomatoes, salsa verde and squiggles of a blend of mayo, Tabasco, and lime (or lemon) juice. 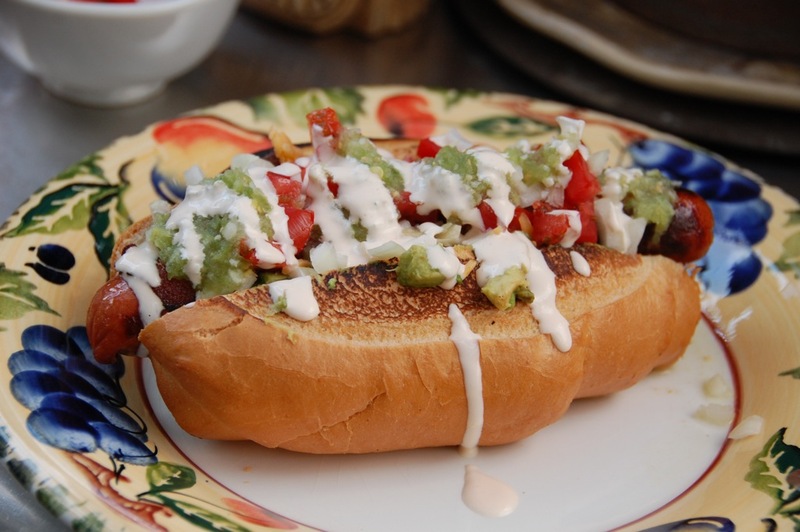 Earlier this month, The Huffington Post said, “Make Sonoran Hot Dogs, And You’ll Never Go Back.” The history of the Sonoran hot dog can be traced from Hermosillo, Sonora, to New York, Los Angeles, and Tucson. Perhaps TBM has earned enough dietary credits to do another Tucson Sonoran Hot Dog test! **Asian Vegetarian Feast: Tempting Vegetable And Pasta Recipes From The East, Ken Hom, William Morrow and Company, New York, 1988, p. 150-151. Author’s note: For additional visual delights, see “A Peruvian Apple Cactus interlude,” History Safari Expresso.